Figure 1: Canon XC10—UHD/FHD 4:2:2 camera with a 1-inch CMOS sensor. After twenty-five NAB shows I’ve developed a pattern of booths to visit each day. At NAB 2015 walking though a series of expensive C-series cameras in the Canon booth, I encountered a new species of video camera—the XC10. (Figure 1). It looked like neither a DSLR nor a camcorder. Today, almost every camera delivers high quality video. This allows a buyer to focus on functionality, cost, and ergonomics. Camcorder design falls into two broad camps: the shoulder mounted bazooka (Figure 2) or the handheld soda can (Figure 3). 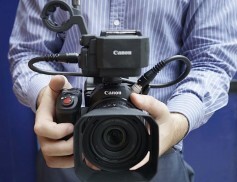 Figure 2: Canon C300 Mk2 in a shoulder-cam configuration. 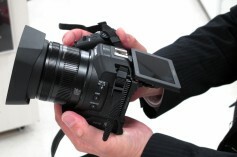 Figure 3: VIXIA HF G20 released by Canon in 2013. My issue with the former—unless perfectly balanced, it has a tendency to rock forward and backward. The latter has a tendency to roll left or right unless it has a well-designed grip. Both camera types are different from the proven film camera design shown in Figure 4. Figure 4: Canon second-generation 1014XL-S released by Canon in 1979. The SLR design was created for shooting photographs (Figure 5). One would hold it up at eye level for a short period while shooting stills. Thus, an SLR needed to provide only a minimal grip. Shooting several minutes of video presents a very different situation. 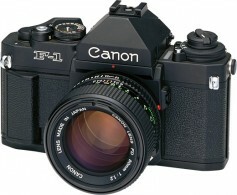 Figure 5: F-1 released by Canon in 1981. Most DSLRs have an LCD screen so typically they will be held high, as are smartphones, several inches away from the face thereby making them susceptible to jiggle in all three-dimensions (Figure 6). More frustrating, the LCD image is likely to be partially or completely washed-out under bright light. 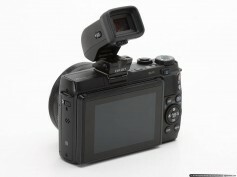 Figure 6: DSLRs need to be held-up to the eyes when shooting video. I could see the XC10’s ergonomics were clearly different from both camcorders and DSLRs. It was shorter than most camcorders and the large handgrip, which can be rotated 180-degrees, is superior to the grip offered by DSLRs (Figure 7). Figure 7: The XC10’s large handgrip rotates forward and backwards 90-degrees. The XC10 in the booth had its ”viewfinder” loupe attached so I could see how the camera might be used in direct sunlight (Figure 8). Figure 8: XC10 “viewfinder” loupe attached to the 3-inch LCD screen. Because the loupe is attached to the LCD screen, which can swing up or down, one can look down into the viewfinder—which I prefer—or up into the viewfinder which is typically impossible with a camcorder’s viewfinder. Without the loupe attached, one can view at the 3-inch LCD over the same range (Figure 9). Figure 9: XC10 1-million dot LCD screen can swing up or down. The XC10 in the booth had two other positive features: a button that enables/disables an ND filter (a “no show” on DSLRs) and a dial-free and near button-free rear panel. DSLRs typically have a dial and many seemingly randomly placed buttons (Figure 10). Worse, most DSLR viewfinders are fixed in rear facing position. 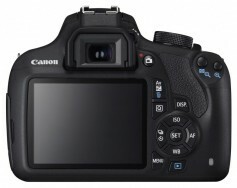 Figure 10: Canon DSLR with its many buttons and a complex dial. The XC10 was free of these controls (Figure 11). 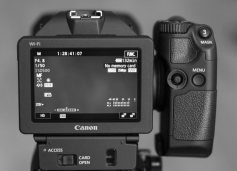 The camera’s menu is, however, as frustrating as that of any DSLR—totally unlike the C300 Mk2. For me the XC10 was ergonomic love at first sight. Unfortunately, ergo-eroticism can make one overlook functionality and cost. Functionality, of course, has many aspects. One aspect—the design of the image capture components. These are first class on the XC10. Canon equipped the XC10 with a 1-inch (12.8mmx9.6mm/16mm diagonal) 13.6 megapixel CMOS sensor. The XC10 can capture 4000x3000 (4:3) or 4000x2664 (3:2) photos. When shooting video, a 16:9 window captures 3840x2160 pixels from the sensor. True (4096x2160) 4K video is not supported. Gamma options include: Standard, EOS, Wide DR, Cinema EOS, and Canon Log. All but the latter are designed to match the BT.709 standard. UHD video at 305Mbps and 205Mbps can only be recorded to CFast 2.0 cards. Frame-rates of 23.98fps and 29.97fps are supported. (Neither 24fps nor 25fps are available.) When shooting 1920x1080 HD, frame-rates of 23.98fps to 59.94fps are recorded to SD cards at a 35Mbps or 50Mbps data rate. Photos—JPEG but not RAW—are also recorded to SD cards. Additional frame-rates, relative to 29.97fps, of X1/4, X1/2, X2, X4, X10, X20, X60, X120, and X1200 are possible. Unfortunately, X1/4 and X1/4 are not available when shooting UHD. Both UHD and HD are recorded with an .MXF wrapper using the XF-AVC codec—Canon’s version of AVC/H.264. 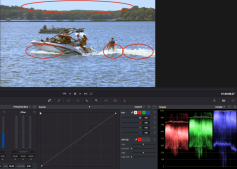 UHD is recorded using intra-frame compression while HD is recorded using inter-frame long GOP compression. Two-channel, 16-bit PCM audio is recorded at 48kHz. The XC10’s HDMI port outputs 10-bit 4:2:2 data allowing recording ProRes HQ 4:2:2 or DNxHR HQX 4:2:2 video with recorders like the Atomos Shogun. Minimum gain is ISO 160 (0.0dB gain) and minimum aperture is f/11. Using a lightmeter (160 ISO and 1/48th second shutter-speed) in Las Vegas on bright sunny days I typically read calculated exposures of f/22 to f/32. Enabling the camera’s ND filter (ND8) reduces an f/32 exposure by 3-stops which brings the aperture down to f/11. Thus, the XC10’s ND filter is adequate—but not when shooting on snow, sand, or water where the calculated exposure can exceed f/32. Figure 12 shows a slightly overexposed image—you cannot see highlight detail in the boat’s wake. Figure 12: Shot at ISO 160, ND8 filter, Tv 1/48th second, f/11. Figure 13 shows it’s possible to obtain a bit more highlight detail, but clipping prevents full highlight detail recovery. Clipping likely is the result of inadequate dynamic range. Figure 13: RGB Gain reduced and RGB Gamma equalized. In very bright light, you’ll need to use the Canon ND8 filter plus an ND4 (-2 stops) filter to drop the aperture to between f/6.3 and f/5.6. These values nicely minimize possible diffraction from an f/11 aperture. To achieve a shallow depth-of-field, the XC10’s aperture should be set at f/3.2 to f/2.8. (The possibility of diffraction is lower with an f/3.2 aperture.) Canon’s ND8 filter plus an ND16 (-4 stops) filter yields a moderately shallow depth-of-field. To work effectively with the XC10, you’ll need to purchase an ND4 and an ND16 filter, or a very high quality (read—very expensive) vario-ND filter. 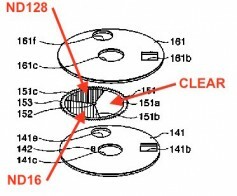 Canon has a patent on a three-position ND filter shown in Figure 14. Were it possible to redesign this filter for a 1-inch sensor, it would eliminate the need to attach ND filters to the XC10. (For very good reasons, most camcorders offer multiple ND filter settings.) Canon might be able to implement a -6dB (ISO 80) setting and/or an ND16 (-4 stops) update to the camera’s filter. Figure 14: Under all light conditions the proposed filter yields apertures from f/9 to f/2. When shooting C-log, middle-gray should be exposed at 33% rather than 42.5% while 90% white should be exposed at 62%. These specifications require setting exposure from 1- to 1.5-stops lower. Figure 15 shows the necessary reduction for middle-gray skin tone. Figure 15: XC10 middle-gray—1-stop reduction (f/2.8 to f/4). When one engages C-log, the XC10’s minimum ISO increases from 160 to 500—a reduction of 1 1/3-stops thereby eliminating the need for a shooter to compensate exposure when using log gamma. XC10 C-log footage looks less washed-out due to the increased recording gain. 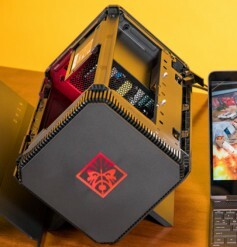 Read my Zero Math Understanding of Log Gamma article to understand the positive and negative affects of the XC10 system. I found the XC10 to deliver superb video and stills. It captures clear images without having a sharp “video” look. The XC10's picture is very faithful to reality. Colors are saturated, yet not too vivid. Only minor scene touch-ups were required (Figure 16). Figure 16: XC10 colors are saturated, yet not too video vivid. Skin tones are rendered so naturally I needed to make only minor corrections (Figure 17). Figure 17: XC10 skin tones are rendered naturally. While the overall operation of the XC10 is satisfactory, in several areas improvements could be made. These include the zoom mechanism, VF loupe attachment, and the lack of chroma sampling options. I’m hard pressed to think of a non-interchangeable lens Canon camera that has no power zoom. This lack requires one to use their left hand to turn the lens-ring rather than simply move a small lever with their right hand’s index finger. The latter is faster and it allows one to zoom while recording. While the LCD loupe does block sunlight, it doesn’t offer great image quality. When one doesn’t need to use the loupe, it must be detached. The “where do I put the loupe” dilemma could be solved by a hinge to enable the loupe to be flipped to one side and which also allows it to be detached. Canon has a product, shown in Figure 18, which suitably upgraded and equipped with a short HDMI cable, would be a far better VF solution. Figure 18: Canon EVF-DC1 viewfinder mounted on a Canon DSLR. As shown in Figure 19, Canon’s newly announced XC15 offers a shoe-attached option for audio XLR connections. My hopeful, but wrong assumption, was the box also incorporated a viewfinder. Canon was unresponsive to any of my questions so at this point it’s unclear whether the XC15, at about $2400, replaces the XC10 or whether the XC10 will continue to be sold albeit at a lower price. 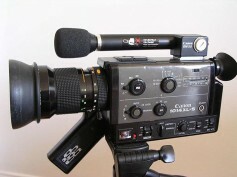 Figure 19: New Canon XC15 with attached XLR audio box. When DV, DVCAM, and DVCPRO were introduced, editors complained that green/blue-screen compositing would be difficult with 4:1:1 chroma sampling. With increased computing power supporting more sophisticated compositing algorithms, most shooters buying an under $2,500 camera expect to work with 4:2:0 color sampling. While the XC10’s 4:2:2 chroma sampling provides greater chroma information, when recording at 305Mbps, a 64GB CFast card fills in about 25 minutes. (Canon does include one 64GB card plus a CFAST reader with the XC10.) To be able to record, for example, 3-hours of video you will need to purchase six additional cards. The current street price for a 64GB card is about $200 which brings the media cost to $1,200. Media cost, plus the current XC10’s $2,000 street price, brings the total buy-in cost to $3,200. At these prices, one can purchase an interchangeable lens Super35 sensor camcorder (with lens) that records 4:2:0 4K/2K/UHD plus 4:2:2 HD. Canon could mitigate the cost of media, as well the cost of the necessary very large amount of very fast mass-storage by providing a firmware update for the XC10 that offers the option of 4:2:0 recording. Switching from 4:2:2 to 4:2:0 drops the amount of recorded data by 50-percent. Using the same compression-ratio employed at 305Mbps, CFast media costs would be cut in half. Using the same compression-ratio used at 205Mbps, the data rate would be only 100Mbps. By recording to high-speed SD cards, a significant media cost reduction would be achieved. The XC10 would thus become cost-competitive for shooters other than those who buy it as a B-cam for use with their C300 or C500. My issues with certain aspects of XC10 functionality does not detract from the camera’s ability to shoot both video and stills; a camera that provides Auto, Manual, Program, Shutter priority, and Aperture priority operation; an excellent AF system (with my favorite—a Push AF button); AF with face detection and tracking; manual focus via a lens ring; OIS/EIS stabilization; both pre-record and interval recording; full timecode functions; extensive WiFi capabilities; an optional GPS receiver; and has a fantastic set of audio functions (Figure 20). 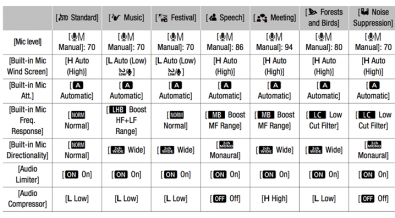 Figure 20: XC10 suite of audio functions. The Canon XC15, because it provides histogram and waveform monitors, plus HDR-like gamma, is the model to buy even if you don’t require the XLR audio system. Unless, of course, Canon significantly reduces the price of the current XC10. You’ll need to monitor street prices to make an informed decision about which model makes financial sense to you.